With just two full weekends remaining of the 2017 NCAA football season, some players have sent their 2018 NFL Draft stock soaring. Be it a quarterback who could break a PFF College era record or cornerbacks who you are better off throwing the ball into the dirt rather than throwing into their coverage, the 2017 season has been nothing but an exciting one. The running back position has grabbed headlines all season long with the impressive run of games by Stanford’s Bryce Love and Penn State’s Saquon Barkley, each of which vaulted them into the Heisman conversation. With that in mind, PFF’s Draft Team highlights the draft-eligible leaders in elusive rating, the PFF-exclusive signature stat that sheds a better light on a running back’s ability to make defenders miss on a per touch basis. 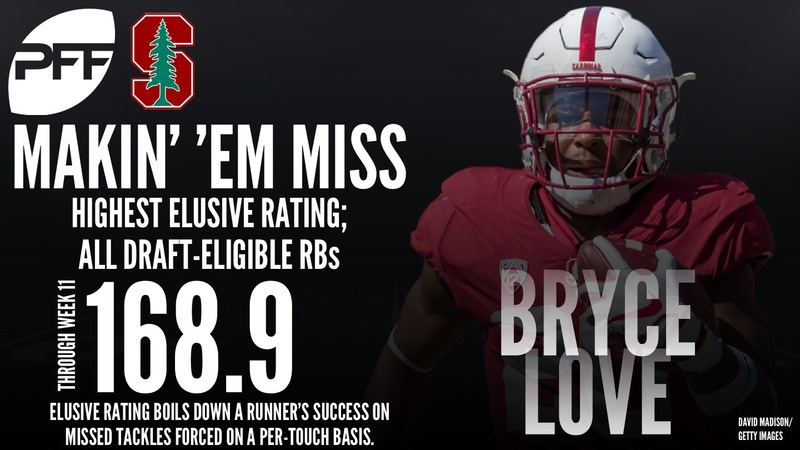 Bryce Love has dominated opposing defenses on more than one continent this season – Stanford played Rice in Australia to start the season and Love forced six missed tackles on only 13 carries. Love’s biggest games have come against UCLA where he forced nine missed tackles on 30 attempts on his way to 263 yards and against Arizona State where he forced 12 missed tackles on 25 carries and 301 rushing yards including 175 yards after contact. While it’s physically impossible for a Stanford running back to win the Heisman trophy, Love will have a future in the NFL. Josh Adams runs with power and a strong leg drive that allows him to break tackles with regularity. Adams only had eight carries against Miami (Ohio) but forced seven missed tackles, the most of any game he’s had this year. Adams also had a very productive game against Boston College when he forced six missed tackles on 18 attempts while rushing for 229 yards including 183 yards after contact. Adams is averaging an incredible 5.9 yards after contact per attempt so far in 2017 showing he can be productive on his own. Damien Harris’ game is a mix of speed and power like many Crimson Tide running backs before him. Harris is part of a deep Alabama roster and therefore doesn’t have as many carries as some of the other players on this list but NFL teams love players with production in the SEC and Harris has done just that when he’s been on the field. Harris forced four missed tackles against Arkansas on only nine carries and 97 of his 125 rushing yards came after contact. Harris is averaging 5.4 yards after contact per attempt on the season. Scott’s game is an exciting blend of super quick jump cuts, excellent balance and very strong legs to run through contact. The diminutive Scott may only stand 5-foot-6 but he is a nightmare for defenses in space and can be used effectively in the pass game as well. Scott’s most productive game came against Florida Atlantic when he forced five missed tackles on 19 carries and then forced another three missed tackles as a receiver on five catches. Scott will have value to NFL teams as a player who can create in space. 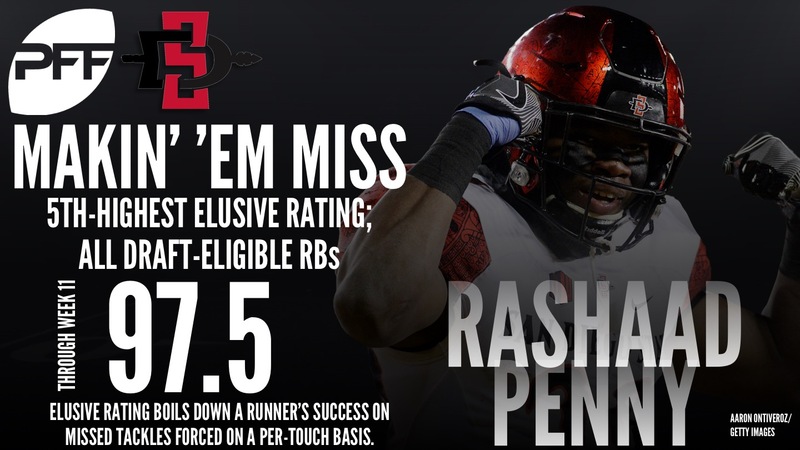 Rashaad Penny is one of the most productive yet little known players in the country. Penny has 931 yards after contact on the season and averaging 4.0 yards after contact per attempt. Penny has performed well against Power-5 competition and rushed for 214 yards against Arizona State with 188 of those yards coming after contact and forcing four missed tackles on 19 carries. Against Stanford, Penny had 106 yards after contact and forced six missed tackles on 32 carries. Penny is also a dangerous kick returner who has at least one kick return for a touchdown in three straight seasons. Catch No.’s 6-20 of the rankings with your PFF Edge subscription!